Join us for the April meeting of the Kalamazoo Amateur Radio Club at the Red Cross Chapter House on Thursday, April 18 at 7 p.m. The educational topic will be Ham Radio Podcasts presented by Mark Kerstetter (KE8HAA). The presentation will discuss what podcasts are and how to use them. We will explore 10 podcasts about amateur radio comparing their content and format, frequency of release, length, website, and even listen to samples. At the meeting we will also discuss our planned MI QSO Party activity for April 20. Two donated SDR receivers will be won by the hams collecting the most contacts. A radio club near Ann Arbor is planning a one day bus trip to Hamvention in Xenia, OH. We'll present costs and details at the March meeting. You and other club members and friends are invited to this event. The event is FREE. Please pass the word about our club and this meeting to your friends. We post information about events on W8VY.ORG and on our Facebook page â€œKalamazoo Amateur Radio Clubâ€� (click on Events). We also have a calendar on our website. Join us for the March meeting of the Kalamazoo Amateur Radio Club at the Red Cross Chapter House on Thursday, March 21 at 7 p.m.
Our Club meeting will begin with a memorial to Paul Meija (K9RRX). The educational topic will be Practical Antennas presented by Randy Mead (KE8R). The presentation will include discussion of and building a dipole and an off-center-fed antenna. We will also examine some antennas that others bring. 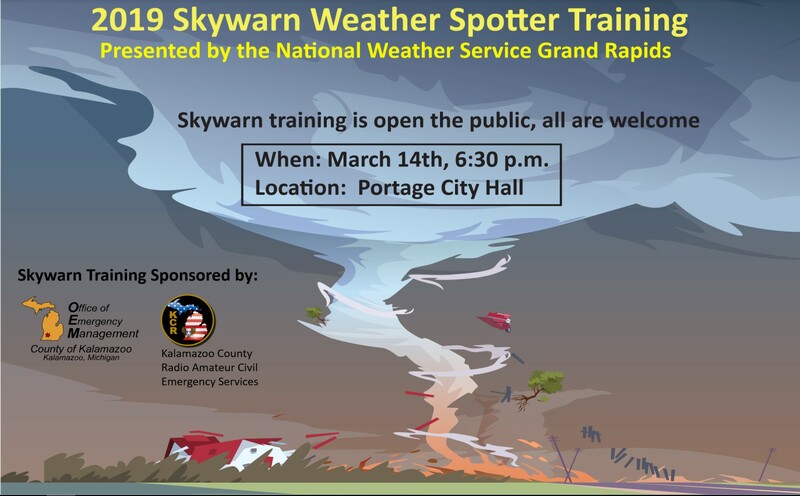 Kalamazoo County will host its annual Skywarn Weather Spotter Training on Thursday, March 14-th at 6:30 pm at the Portage City Hall. Hams and the general public are invited. The program should last about two hours. The LoSTeam or Line of Sight Team Schedule for 2019 has been created. You can download it Here. LoST is an event held on most Wednesday evenings (from April through August) to practice portable and emergency communications techniques. Hams deploy to various locations throughout Kalamazoo County and use portable equipment to "check-in" to the Kalamazoo County Public Service Corps Net. Scott (KD8RCI) organizes the events. Thanks Scott! The first six members are voting members of our Board. K.A.R.C. Board meetings for 2019 will move to the second Tuesday of the month. Club meetings remain on the third Thursday of the month. 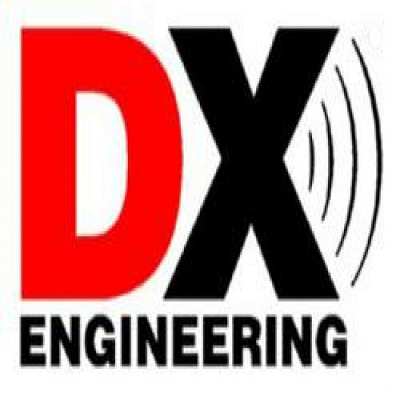 Join us for the February meeting of the Kalamazoo Amateur Radio Club at the Red Cross Chapter House on Thursday, February 21 at 7 p.m.
Our club offers a special live Skype presentation and interaction with the DXengineering staff. We will hear about amplifiers, how they work, amplifier characteristics and when to use them. The first 30 people that arrive and attend the presentation will get DXengineering hats. Join us at our gathering. Spread the word about the event and invite your friends. We've rented the gas heated 6 person cabin for Friday night January 25 and Saturday night January 27. WFD actually runs from 2 pm Saturday to 2 pm Sunday. The cabin is primitive with no electricity and no water. There is an outhouse bathroom. You can look at a map to our cabin Ft. Custer Map. Follow the red line from the Dickman Road Entrance to the cabin symbol within the red circle. If you are interested in operating, either overnight or during daylight or evening hours on January 26-27, please contact secretary@w8vy.org. If you'd like to help, please use the same contact info. We'll try to coordinate operators for Winter Field Day. Anyone participating or wishing to visit operators will need a Recreation Passport. MI State Parks require a passport on all motorized vehicles that enter a park. The Recreation Passport is NOT included in the camping fees. Michigan residents can purchase their vehicle recreation passport for $11.00 or their motorcycle recreation passport for $6.00 when they renew their license plate. Beginning Jan 1, 2018, Michigan Residents will incur a $5.00 Convenience Fee when purchasing a Recreation Passport at the Park. For more information visit www.michigan.gov/recreationpassport. Join us for the January meeting of the Kalamazoo Amateur Radio Club at the Red Cross Chapter House on Thursday, January 17 at 7 p.m. This month Charles Agosti (WD8AXA) will talk about and demonstrate "HF ALE (Automatic Link Establishment) Technology using Two Radios". W8VY will participate in Winter Field Day on January 26-27, 2018 from 2 pm to 2 pm EST. We will be renting a rustic cabin along the Kalamazoo River in Ft. Custer State Park. The cabin accomodates 6 operators with overnight bunks, and outdoor grill and fire ring. The cabin is gas heated, but there is no water or electricity and sanitary facilities are in an outhouse. We'll have the same challenges as ARRL Field Day in June, but without tents and with heat. We'll also have the challenge of a new location. 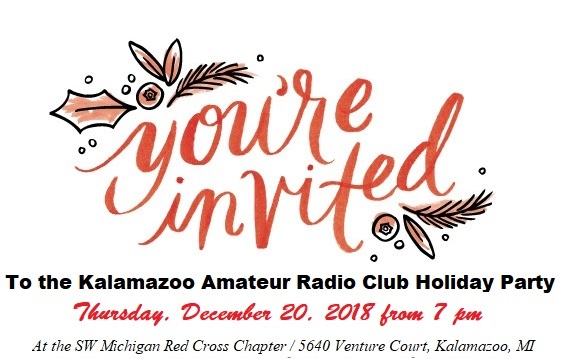 You are invited to the Kalamazoo Amateur Radio Club annual Holiday Party at the Red Cross Chapter House on Thursday, December 20 at 7 p.m.
Bring your spouse or friend or come alone. The party is free and there is no RSVP. Please bring a dish to share, if you can. Enjoy good fellowship. Join us for the November meeting of the Kalamazoo Amateur Radio Club at the Red Cross Chapter House on Thursday, November 15 at 7 p.m. The meeting will also allow members to renew their memberships in KARC. Others can join our amateur radio club. The Club is also seeking members for nomination to our Board for 2019. Prior experience is not necessary. Our Club depends on volunteers to contintiue to exist. Join us for the October meeting of the Kalamazoo Amateur Radio Club at the Red Cross Chapter House on Thursday, October 18 at 7 p.m.
Jim Gork (N8JG) will be talking about his "Traveling Radio Station". Discover how Jim plays radio and makes contacts as he travels around the country. Join us for the September meeting of the Kalamazoo Amateur Radio Club at the Red Cross Chapter House on Thursday, September 20 at 7 p.m.
We are going to have a Members Only hamfest before the October hamfest to allow members a chance to purchase items from the old AVCOM trailer at the meeting. It will be a silent auction with a minimum bid on each item. Please bring cash or check. Sorry, we cannot accommodate credit or debit cards. The meeting will also allow us to chat and plan for our fall meeting schedule. Note: There is a change of location for our June KARC meeting. The Club meeting will start promptly at 7 p.m. We'll meet at the pavillion in Flesher Field on 9-th Street, south of the intersection with Stadium Dr. This month Charles Agosti (WD8AXA) will talk about and demonstrate "Contact with Military Satellites". Dave Moss (KE8DI) will talk about our Field Day prep. The last part of the meeting will move to our new Field Day site behind the Oshtemo Fire Station on West Main Street (M-49) west of 11-th Street. Here is a photo of our ARRL Field Day 2018 Operating Location. This month John Mathieson (AC8JW) will talk about the Automatic Packet Reporting System (APRS) node he implemented in the KARC Radio Room for W8VY. If you are attending Hamvention in Xenia, OH on May 18-20, be sure to look for other members of KARC. Charles Agosti (WD8AXA) has a spot in the Flea Market, stop by and say hello. Take a look at what he's offering for sale. Perhaps he has something you need or want. Anyone want to organize a talk frequency for our Hamvention travelers? Contact a Club Officer. Join us for the April meeting of the Kalamazoo Amateur Radio Club at the Red Cross Chapter House on Thursday, April 19 at 7 p.m.
Our program for April is all about local repeaters. Chuck Agosti (WD8AXA), KARC VP, will talk about our local repeaters both analog and digital. You'll also get a pocket guide with repeater information. Alex Stuart (KE8ICM), KARC Treasurer, will talk about the new super controller on 040. Join us for the March meeting of the Kalamazoo Amateur Radio Club at the Red Cross Chapter House on Thursday, March 15 at 7 p.m.
Randy Mead (KKE8R) KARC member and Member At-Large on our Board will speak about how he designed and constructed a large hinged tip-up tower at his QTH. Skywarn Training for Spring 2018 will be held on Saturday, March 10 from 2 p.m. until 4 p.m. at Paw Paw High School off Red Arrow Highway. There will not be training in Kalamazoo this winter or spring. Ask about ride sharing. You do not need a reservation, just show up. You do not need to be a ham to participate. Join us for the February meeting of the Kalamazoo Amateur Radio Club at the Red Cross Chapter House on Thursday, February 15 at 7 p.m.
Al Melon (N8KLI) of the State of Michigan DIT will speak about the Michigan Public Safety Communication System (MPSCS) and the public safety radio network on 800 MHz. This is the "largest in the U.S."
Skywarn Training for Spring 2018 will be held on Saturday, February 24 from 10 a.m. until noon at Lakeview High School in Battle Creek. There will not be training in Kalamazoo this winter or spring. If you have questions, contact our Emergency Coordinator, Gary Wightman wa8mcd@w8vy.org Ask about ride sharing. You do not need to be a ham to participate. The LoST or Line of Sight Team Schedule for 2017 has been created. You can download it Here. LoST is an event held on Wednesday evenings to practice portable and emergency communications techniques. Hams deploy to various locations throughout Kalamazoo County and use portable equipment to "check-in" to the Kalamazoo County Public Service Corps Net. The new year is bound to bring some changes, but we hope to keep up the good things we've done in the past. Join us for the January meeting of the Kalamazoo Amateur Radio Club at the Red Cross Chapter House on Thursday, January 18 at 7 p.m.
We are electing three candiates for the Board at the meeting. We'd also like to hear what you'd like to do in 2018. Got some ideas for kit builds? Want to learn some digital modes? Up to helping out the local community? DXing? Contesting? Any changes to Field Day? How about our Hamfest? Any suggestions for things to do (or not do)? The LoST or Line of Sight Team Schedule for 2017 has been created. You can download it Here. LoST is an event held on Wednesday evenings to practice portable and emergency communications techniques. Hams deploy to various locations throughout Kalamazoo County and use portable equipment to "check-in" to the Kalamazoo County Public Service Corps Net. April's club meeting is This Thursday April 20 2017. The theme of the meeting is "Spies Like Us." Doors open at 6:30 and the meeting Starts at 7pm at the American Red Cross Chapter House in Kalamazoo. LISTEN: to recordings of short wave stations sending secret messages to spies. SEE: Vintage radios used to receive spy transmissions. EAT: Chocolate cookies from Mindybear cookie company. Take home your own instruction book on how to use one time pad encryption. Whether you are just passing through or live and work in the Kalamazoo Area, we hope you find the following list of repeaters helpful. Oshtemo 51.720 - 500 kHz FM 94.8 S.M.A.R.T. Oshtemo 147.040 + FM 94.8 S.M.A.R.T. Oshtemo 444.875 + FM 94.8 S.M.A.R.T. The Kalamazoo Amateur Radio Club was founded in Kalamazoo in 1924. That is less than 30 years after Marconi sent and received his first radio signals in Italy in 1895. It was also seven years before the first broadcast radio station in Kalamazoo, WKZO, transmitted its first signal. WKZO is still on the air today. In 1980, disaster struck Kalamazoo. The famous 1980 Tornado touched down just west of Kalamazoo on May 13, 1980 shortly after 4:00pm. It cut a swath through Downtown Kalamazoo and out to the eastern suburbs. It was an F3 tornado that cut an 11-mile-long path in approximately 20 minutes. Five deaths were attributed to the Tornado. The Hams of Kalamazoo not only sprang to action immediately following the tornado, but also worked to help the community be better prepared for a future disaster. The Kalamazoo Amateur Radio Club added receive links in Downtown Kalamazoo and Richland, Michigan to provide better two-meter repeater coverage to the county. Also a successful fundraising campaign allowed for the purchase of a NOAA Weather Radio Transmitter and placed weather alert receivers inside many schools and businesses to provide more advanced warning in the future. The KARC has had a long-term relationship with the Greater Kalamazoo Chapter of the American Red Cross. A club station, call-sign W8VY, is located in the basement of the Red Cross Chapter House. Members of the Amateur Radio Community were instrumental in the design and implementation of the communications for not only the Ham Radio Station, but also the Red Crossâ€™ communications needs. Anyone with additional historical information about the KARC that should be included on this page are encouraged to e-mail the webmaster. We invite you to join the Kalamazoo Amateur Radio Club today. Full membership is open to those holding a current Amateur Radio License. Those that are interested in Amateur Radio but not yet licensed may apply for an associate membership. Dues are $25 per year, and the fiscal year runs through September 30th each year. There are discounted memberships available for students, seniors and families. By becoming a member of the KARC you are financially supporting the club programs including maintaining the repeaters, the W8VY station and community service projects. Thank you for your support! To become a member or renew your membership, you can pay dues in person at a KARC meeting or mail your check or money order to KARC PO BOX 773, Portage, MI 49081-0773. Clicking the following links will download a copy of a file to your device. American Radio Relay League â€“ This is the national association of Amateur Radio. The KARC is an affiliate club. R.A.C.E.S. This stands for Radio Amateur Civil Emergency Service. Kalamazoo County Races operates under the Kalamazoo County Sherriffâ€™s Office of Emergency Management. A.R.E.S. This stands for Amateur Radio Emergency Service. While this sounds similar to R.A.C.E.S. their functions are specifically different. Visiting the A.R.E.S. Michigan website provides more information. The Kalamazoo Hamfest is an annual convention that is sponsored in a partnership with the Kalamazoo Amateur Radio Club and the Southwest Michigan Amateur Radio Team. It is normally the third weekend of October. The Kalamazoo Amateur Radio Club works the the Southwest Michigan Chapter of the American Red Cross. The Red Cross provides a facility for the W8VY club station as well as a location for meetings and projects. The Radio Club assists the Red Cross with communication needs and provides annual financial support. The American Radio Relay League and the W5YI Group both publish books and other study materials to help prepare you to pass your license exam. You can start as a Technician and work your way up, or if you are able to pass multiple tests at the same time you can start as a General or Amateur Extra class licensee. Each class of license comes with more privileges of both frequencies and transmission types that are allowed. The Kalamazoo Amateur Radio Club offers classes to help you prepare for the Technician and General class licenses. To get more information about local classes click W8UH.NET Classes are usually offered in the fall. Our volunteer instructors are willing to offer classes more often if there are at least five people that will attend. The license exams are administrated by a team of volunteers that have been trained to provide the exams. Currently, test sessions, also known as Volunteer Examiner Sessions or VE Sessions, are offered in Kalamazoo in the odd months. January through May VE Sessions fall on the fourth Saturday, and July through November VE sessions fall on the third Saturday. Check the Calendar Page for specific dates and times. VE Sessions are held that the Kalamazoo County Sherrif's Department on Lake Street in Kalamazoo. John Tucker WB8ZVV organizes the sessions and should be contacted for specific directions if it is your first time testing in Kalamazoo. E-mail John at trustee@w8vy.org. VE Sessions can also be found at most "Hamfests" - local Ham Radio conventions and swap meets. An annual Hamfest is held in Kalamazoo in October. This feature of the KARC website has not yet been activated. When implemented, only current members of KARC will have access to specific information like members list, member interest profiles, materials distribute at club meetings, etc. These are perks of KARC membership that will not be accessible to the general public.